Note: you don't have to manually set the time and venue on each game – you can do that in bulk by entering your time slots. Please see the Getting Started Guide. However, if you need to fine tune your schedule, it is easy to make manual tweaks. Venue, time, and referee are all clickable. Clicking on the time also lets you change the date. You can drag a team onto another to swap them. You can also grab a game by the V in the middle and drop it onto another game to swap their time, venue and referees (if any are assigned). Change the week, assign assistant referees / umpires / officials, or designate a game as a friendly (scrimmage – not counted for standings). You can also click on a date to shift all the games on that day to another date - and another week if necessary. If you change a date in Week 1, you'll be asked if you want to move the entire season by the same interval. E.g. if you changed November 1 to November 21 under Week 1 and confirmed YES, all games will be moved 20 days into the future. 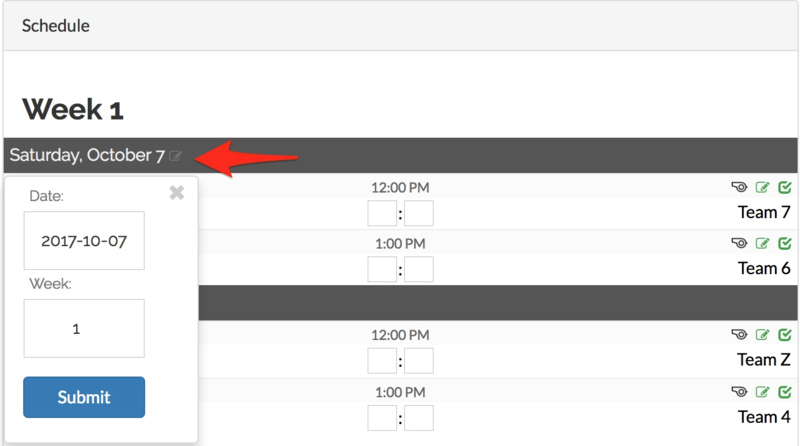 In PRO we also have a calendar view available that allows drag and drop. See this article for details on that.